You can improve the speed of your computer by removing the Aero Shell in Windows Vista. Microsoft spent a fortune tying Vista and Aero Glass together in the minds and pocketbooks of computer consumers. In fact, a large percentage of all Vista Home Basic users upgrade to Home Premium because they want to get Aero Glass. What the ads don’t tell you is that running Aero on your computer can bog the system down. You can make your computer run faster by cutting out the glitter and fluff, and the speed-up can be considerable if you have a less-capable video card. Right-click an empty spot on the Desktop and choose Personalize. Vista shows you the Personalize Appearance and Sounds dialog box. 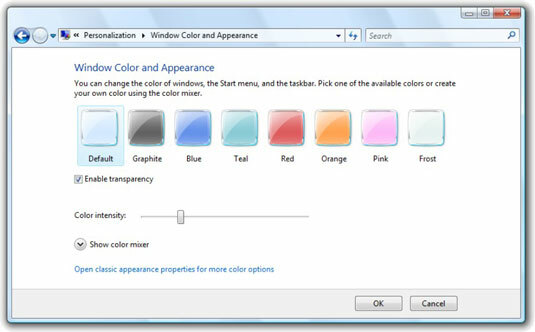 Click the Window Color and Appearance link. Control the Aero shell’s appearance here. 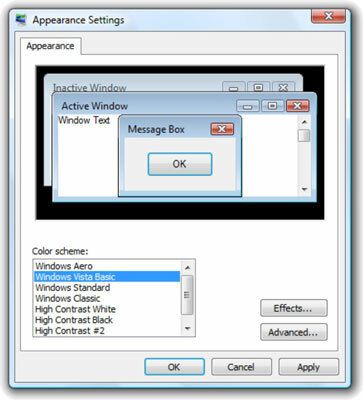 Vista brings up the Window Color and Appearance dialog box. If you don’t see the Window Color and Appearance dialog box, you aren’t running the Aero shell after all. It could be that your graphics card, memory, or video settings are not good enough — or it may be because you got stuck with Home Basic version of Vista. If you see the classic Appearance Properties dialog box. Go on to Step 4. Click the Open Classic Appearance Properties for More Color Options link. The wording here is a bit confusing, but in the end, you get the Appearance Settings dialog box. Choose your preferred color scheme. Vista Basic: The control buttons sit farther down on the title bar; the “X” button doesn’t glow red; and there’s no five o’clock shadow. Windows Standard: Vista also supports the Windows Standard shell, which is identical to what folks used to see in Windows 98, Windows 2000, and other less-mentionable versions. Click OK and, when Vista comes back, “X” out of the Personalize Appearance and Sounds dialog box. Your new shell takes effect immediately. How can you tell how much faster your computer runs without Aero? The short answer: you can’t. Perhaps some day, somebody will come up with a benchmark that can say whether shifting from Aero to Windows Standard on your computer speeds up window handling by 10 percent or 50 percent, but take any such numbers with a grain of salt. The best approach is to simply try it. Change over to Vista Basic or Windows Standard and live with it for a few hours. If you yearn for the Aero interface, switch it back on.